Tonight: Patchy fog. Otherwise, mostly cloudy, with a low around 41. Southeast wind around 5 mph becoming calm. Saturday: Areas of fog before 9am. Otherwise, mostly cloudy, with a high near 64. East wind around 5 mph becoming south in the afternoon. Saturday Night: A 20 percent chance of rain after midnight. Patchy fog. Otherwise, mostly cloudy, with a low around 51. South wind around 5 mph becoming calm. Sunday: A chance of showers, with thunderstorms also possible after noon. Areas of fog before 9am. Otherwise, mostly cloudy, with a high near 71. Calm wind becoming southeast around 5 mph in the afternoon. Chance of precipitation is 40%. Sunday Night: Showers likely and possibly a thunderstorm. Cloudy, with a low around 54. Southeast wind 5 to 10 mph becoming west after midnight. Chance of precipitation is 70%. Monday: A 20 percent chance of showers. Cloudy, with a high near 63. North wind 5 to 10 mph. Monday Night: A 30 percent chance of showers, mainly after midnight. Cloudy, with a low around 52. North wind around 5 mph. Tuesday: A 30 percent chance of showers. Mostly cloudy, with a high near 72. East wind 5 to 15 mph becoming south in the afternoon. Winds could gust as high as 20 mph. Tuesday Night: A 50 percent chance of showers. Mostly cloudy, with a low around 55. South wind around 10 mph. Wednesday: A 30 percent chance of showers. Mostly cloudy, with a high near 64. Wednesday Night: A 20 percent chance of showers. Mostly cloudy, with a low around 40. Thursday: A 20 percent chance of showers. Mostly sunny, with a high near 56. Thursday Night: A 20 percent chance of showers. Mostly cloudy, with a low around 39. Friday: A 30 percent chance of showers. Mostly cloudy, with a high near 62. Escambia County (FL) and Santa Rosa County schools have announced that they will be open on Friday. All schools and bus routes will operate on their regular schedules. In Escambia County, extra-curricular activities may resume after 3:00 p.m., Thursday. A National Junior Honor Society Induction planned for Thursday night at Ernest Ward Middle School will be rescheduled. A Northview High School band fundraising event planned for Thursnight at Century’s What-A-Burger restaurant has been canceled and will be rescheduled for a future date. The “38th Annual Sandy Sansing Spelling Bee” has been canceled for Thursday night and will be rescheduled at a date/time to be announced later. 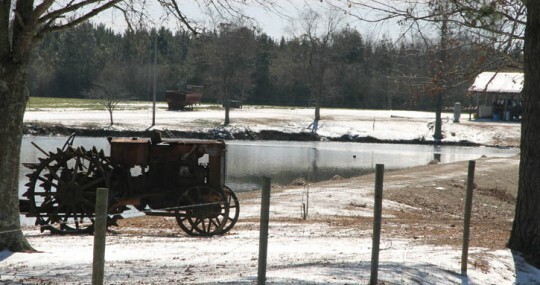 Thank you for turning to NorthEscambia.com for our coverage of our once in a lifetime ice storm coverage this week. Tuesday, Wednesday and Thursday were among our highest traffic days ever, with 6.2 million page views over just a portion of the three day period. Plus thousands upon thousands of Facebook views. 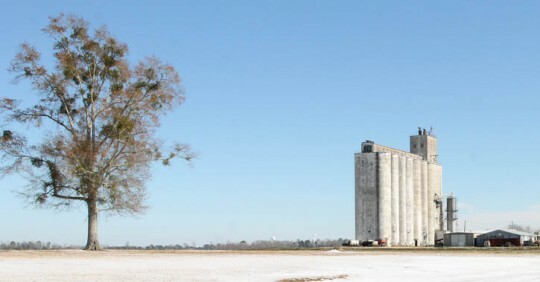 It was amazing to see the area turn to NorthEscambia.com for the latest updates 24 hours a day. When we asked for your winter weather photos, you responded. We published several hundred photos of the thousand or two we received. The photos became a valuable tool for officials to quickly see what kind of weather was being experienced in our communities. Social media, our Facebook page in particular, became a place for the community to come together and share — from road and bridge info to those all important pictures of our little ice man/snowman creations. Don’t forget to “Like” our Facebook page (click here). Sometimes we publish news and info on our Facebook page that never appears on NorthEscambia.com, and sometimes we first publish breaking news there until we have enough details for a full story. Hundreds asked questions about the closure of their school or business, and we did our very best to answer. Some questions went unanswered — we apologize that with our limited staff we were unable to respond to everyone. And in the midst of our rare Florida ice storm came what could have been a major disaster is our own backyard — a large train derailment in McDavid. Minutes after first responders had surveyed the situation and determined what exactly was happening, we published the very first breaking news and continued to update the situation live into the evening and following morning until we knew our friends and neighbors in the area were safe. Thanks again for being part of the NorthEscambia.com family. 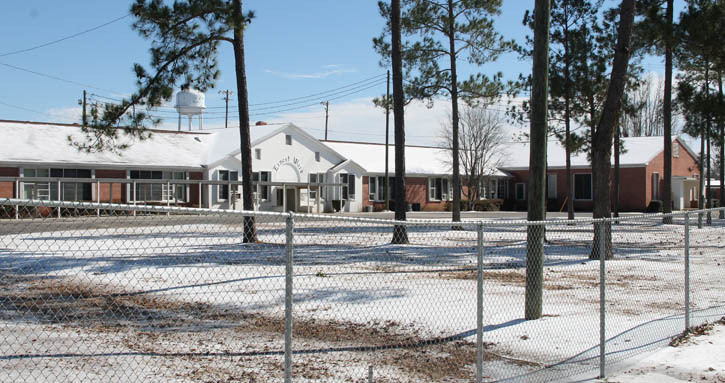 Escambia County public school students were out three days for this week’s winter storm, but they will not have to make up the days. Across the river in Santa Rosa County, students will have hour for hour makeup days, losing part of spring break. “There was enough time built into the regular school year that we can afford for students to miss those three days,” Superintendent Malcolm Thomas said. But, he warned, if the school district misses any other days for emergencies this year, students may be required to make up the time. 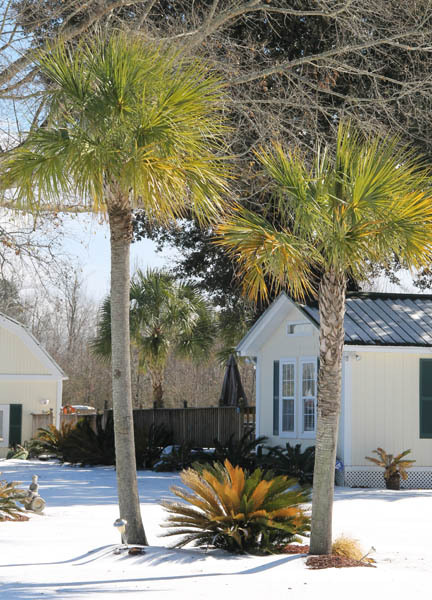 In Santa Rosa County, two of the three days will be made up on March 14 and March 17, the first two days of spring break, with the third date to be determined later. A decision was made Monday that students would be out Tuesday and Wednesday for the impending rare Florida ice storm. By Wednesday, it was apparent that there would be no school Thursday with inches of ice on the ground and lows forecast in the teens. Students in Escambia County, Ala., will also not be required to make up the missed winter emergency days. Pictured top: Inches of ice still covered a closed Ernest Ward Middle School in Walnut Hill early Thursday afternoon. NorthEscambia.com photo, click to enlarge. Helen Joyce Boatwright, 73, passed away January 30, 2014, at her home in Walnut Hill after battling an aggressive form of lung cancer. 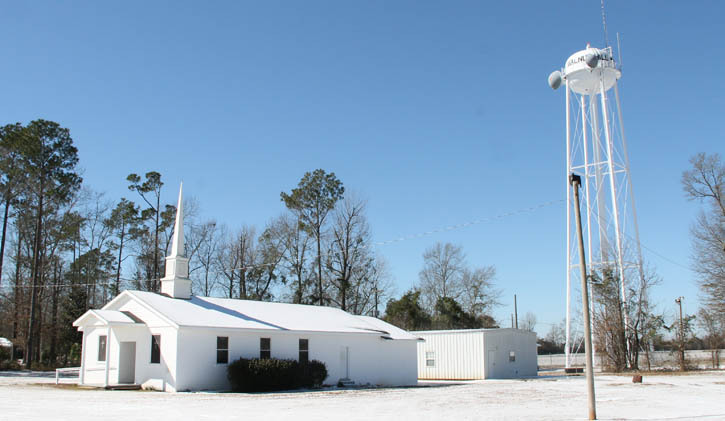 She is survived by her daughter, Connie Ryals, son Danny Ward and his wife Debbie Ward, son Charles Ward and his wife Wendy Ward, daughter Joanne Boatwright, and daughter Sarah Cagle and her husband Phillip Cagle. She is survived by 14 grandchildren and 20 great-grandchildren. She is also survived by her sister Eunice Kleinatland, Buddy Smith, brother Billy Smith and his wife Faye Smith, brother Ronnie Smith and his wife Mary Jo Smith, and sister Judy Amos and her husband Robert Amos. She is preceded in death by her father Arthur Smith and mother Nunie McGhee Smith, husband of 50 years Joe Boatwright, son Larry Ward, and grandson Justin Ward. She is also preceded in death by her brother Dudley Smith, sister Margaret Rigby, sister Zollie Mae Smith, and sister Inez and her husband Ike Holden. Joyce enjoyed spending time with all of her family and friends. She will be greatly missed by everyone. Services will be held tSunday, February 2, 2014, at Faith Chapel North Funeral Home in Cantonment at 9 a.m. Faith Chapel North Funeral Home, 1000 Hwy 29 S, Cantonment, is in charge of arrangements. 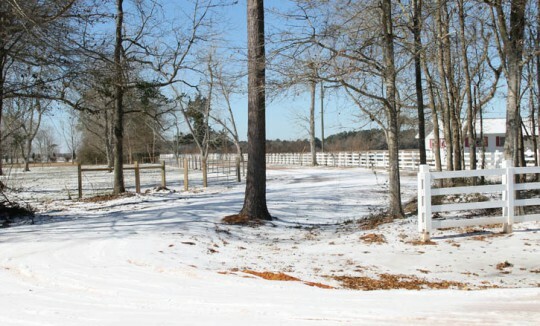 NorthEscambia.com readers submitted literally hundreds of snow and ice storm pictures. We’ve included almost 500 of those photos in the galleries below. For a photo gallery of Thursday snow/ice storm photos, click here. For a photo gallery of more photos, click here. For a photo gallery of Wednesday snow/ice storm photos, click here. For a photo gallery of Tuesday night ice storm and snow photos, click here. Picture this page: NorthEscambia.com photos, click to enlarge. 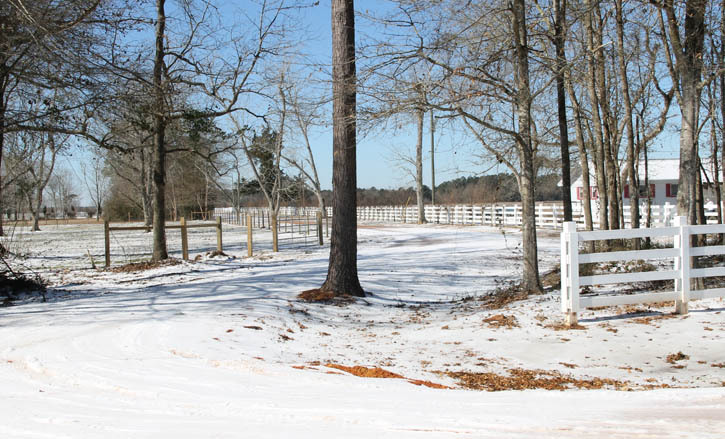 Escambia County’s best laid plans to name an administrator by today were put on ice — very literally — by this week’s winter storm. The Escambia County Commission was set to hold one-on-one job interviews with each of the five finalists for the county administrator position yesterday. Each finalist was to have met separately with individual commissioners in their offices prior to public interviews with the full board in the afternoon. A second special board meeting was to have been held this morning to pick a new top boss for the county if one had not been named on Thursday. But the winter weather caused the postponement of the interviews. They will be rescheduled for sometime during February, most likely toward the end of the month. Jack Brown — Perry, FL. County Administrator, Taylor County BOCC. 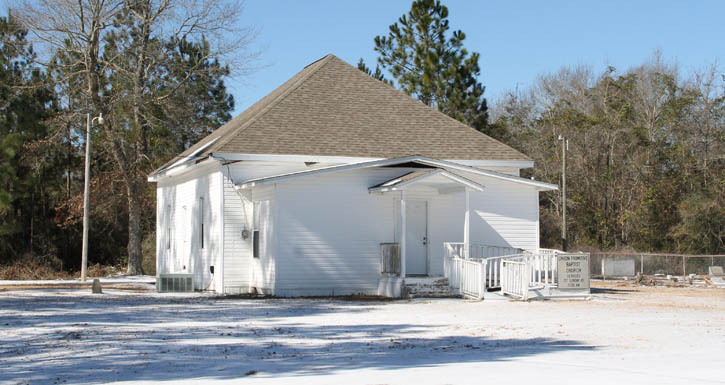 Ted Lakey — Graceville, FL. County Administrator, Jackson County BOCC. Albert Penska — Gettysburg, PA. County Manager, Adams County. William Reynolds — Pensacola. Former City Administrator, City of Pensacola. The original pool of candidates was compiled by the Waters Consulting Group before being cut to five by the citizens committee. Gulf Power crews braved wintry storm to complete power restoration. Thursday afternoon, Gulf Power Company restored power to the last pockets of customers impacted by this week’s winter storm. Since the winter storm began Tuesday afternoon, crews restored power to 47,873 customers. Escambia River Electric Cooperative, the electric provider for 10,000 customers in northern Escambia and Santa Rosa counties, reported on 10 outages during the ice event. 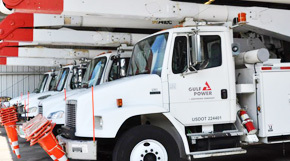 Gulf Power brought in 155 utility workers from other parts of the company to assist line crews and support personnel in the hardest hit areas — Escambia and Santa Rosa counties. In addition, 169 utility workers from sister companies Mississippi Power and Alabama Power, as well as other contract utilities, were brought in as reinforcements. Extra line crews weren’t the only help the utility received —the Florida Highway Patrol and the Emergency Operations Centers in Escambia and Santa Rosa counties were invaluable helping crews find passable roads to reach customers who lost power. • All Gulf Power customer offices are open. • All collection activities have been suspended through Monday, Feb. 3. • Representatives in the Customer Care Center are ready to assist customers 24/7. Just call 800-225-5797. Customers can view an online outage map by computer, smartphone or tablet at MyGulfPower.com and report or check on an outage. They also can check their power usage on MyGulfPower.com by logging into their account. Customers can create an account online or call the Customer Care Center and a representative will help. Customer Care Center: 1-800-225-5797. The Flomaton High School Drama Club will host “Cookies with the Characters” Saturday afternoon in the school’s auditorium. Characters scheduled to appear include Cinderella, Bealle, Tinker Bell, Sleeping Beauty, Spiderman, Elvis, Airel, Tom and Jerry, Clifford and Curious George. After a time of refreshments and photo opportunities with the characters, the movie “The Little Mermaid” will be shown in the auditorium. Admission is $5. 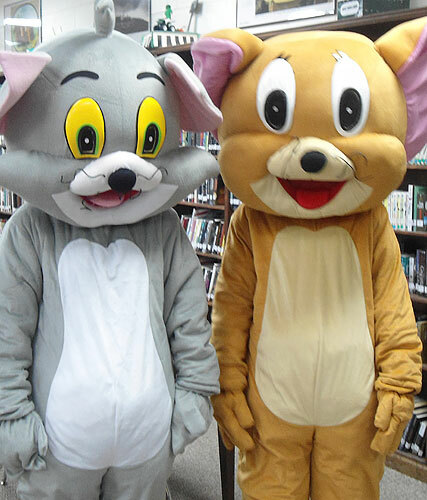 The event begins at 1 p.m.
Pictured: Tom and Jerry will make a special appearance Saturday afternoon at Flomaton High School. Submitted photos for NorthEscambia.com, click to enlarge.